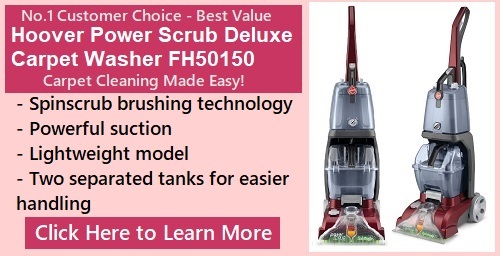 Why The Hoover Carpet Basics Power Scrub Deluxe FH50150 Carpet Cleaner? Hoover is a well-known name in the world of home carpet cleaners. The company manufactures many carpet cleaners especially meant for homeowners. However, one particular model – Hoover Carpet Basics Power Scrub Carpet Cleaner FH50150 – is extremely popular. Let’s find out why! The fact that it’s easy to use makes it a machine worth owning. Anyone can operate it with a few basic instructions. The set up process is quite straightforward too. With just two screws to attach the handle, everything else snaps into place effortlessly. It comes with two water tanks. The first one holds the hot and clean water. The second one is meant to pick up the dirty water. The best part is that you don’t need to guess when to change the contaminated water. The machine will shut off automatically indicating that you need to change the water. Exclusive to Hoover carpet cleaners, Hoover’s SpinScrub Technology ensures that each and every upholstery and carpet fibers are cleaned. Its 360 degree cleaning mechanism loosens the dirt gently and cleans all the sides. With this Hoover model, you don’t really need to worry about those tough stains that have penetrated deep into the fabrics. The SpinScrub Brush system offers a complete deep clean of the area. Many users are pleased to have even older stains removed through the use of this cleaner. A note on the name of this cleaner: The Hoover Carpet Basics Power Scrub FH50150 is the same model as the Hoover Power Scrub Deluxe FH50150. It is also frequently referred to as the Hoover Power Scrub. Pet owners know only too well the dilemma of cleaning up during the shedding season. With pet hair and horrific stains all over the place, cleaning can be a daunting task. But with the Hoover Carpet Basics Power Scrub, a clean home with pets is achievable. The good motor power (10 amps) of this machine ensures that it can effectively handle a myriad of tough pet stains. In addition, the machine comes with an eight foot hose attachment and multiple handtools for more in-depth stains clean if needed. With carpet cleaners, pet hair often gets stuck in the front nozzle at the end of each cleaning session. On this Carpet Basics Power Scrub model, Hoover has made this piece removable so its can be removed and separately rinsed to rid it of the pet hair. This makes maintaining a carpet cleaner that deals with pet hair and other debris so much easier. That said, vacuuming thoroughly before cleaning the carpet with this machine is highly recommended. There is a newer pet version of the Hoover Carpet Basics Power Scrub Deluxe, known as Hoover Power Scrub Elite Pet Carpet Cleaner FH50251. The updated machine, the Hoover Power Scrub Elite, has all the benefits described in this page, plus a few more newer features like a Quick Clean mode, pet stain scrub and antimicrobial brushes. More information can be found in our in-depth Hoover Power Scrub Elite review here. The Hoover Carpet Basics FH50150 is compact in size weighs a little over 18 pounds. This lets you carry this machine around your home very easily. Due to its compact size and attachments, you can easily bring it around and address those odd corners and crevices that are not easily accessible like under or between furniture. It’s more compact size makes it ideal for quickly cleaning up any spills or dirt. Since the machine is small in size, it requires less storage space too. See how the weight of the Hoover Power Scrub with other Hoover cleaners in our carpet cleaners comparison chart. Have you been stuck with a carpet that feels soapy even after you’ve cleaned it thoroughly with water? Well, chances were that you probably added a bit more detergent than required. However, with the Hoover FH50150 model, you don’t really need to bother about the detergent to water ratio. Its automatic detergent mixing system offers the accurate mix of water and detergent. There is also a Rinse/Wash selector switch that will turn off the dispensing of detergent. Users like it because it allows them to rinse their carpets off detergent in an easy manner. With other machine models that lack this feature, you will need to empty out the water tank and then refill it with water only for rinsing. As you can imagine, a lot of people have been using this machine for quite sometime now and are very happy with the results. The best way to get optimum results with this machine is to vacuum the entire area that you plan to clean. The Hoover Carpet Basics Power Scrub Deluxe Carpet Cleaner FH50150 comes with all the key features that most users would like in a household carpet cleaner. It is simple to use, cleans well and lightweight. Many pet owners have given their thumbs up to this machine because it clears out pet stains well and is easy to maintain. If you are interested in the Hoover Carpet Basics Power Scrub Deluxe but are not quite sure, you may want to compare it to other Hoover cleaner models. You can check our Index of Reviews to check out various listings. Additionally, here is a list of factors to consider: What Features To Consider In A Hoover Carpet Cleaning Machine? You may also want to look into the Bissell brand. Besides Hoover, Bissell is the other major brand for home carpet cleaners. As a start, take a look at the Hoover vs Bissell comparison article.